Come meet the team that makes up All About Massage Day Spa. Bobbi purchased All About Massage and Laser Services in June of 2010. Having stayed at home for 16 years to raise her three kids, she decided, along with her husband Richard, to invest in a business in Downtown Sudbury that would follow her desire to make the world around her a more positive and peaceful place to be. Since then she has grown the business to employee 14 staff and to provide space for Glow Hair Studio. In May of 2014 she expanded the original space to include the former Photo World/Records on Wheels so that the spa now occupies over 4000sqft. Bobbi enjoys being an active community member in both the business world as well as a supporter of the Arts in Northern Ontario. One of her many passions is to share her entrepreneurial spirit with like-minded business women and men, helping to grow each other’s businesses and continue to make the Sudbury economy strong. When she is not working on the business, Bobbi enjoys learning/promoting a healthy lifestyle for herself and her family, including cooking, gardening and spending time with her husband, 3 wonderful children and two dogs. Angelina Labre received her certification from the college of hairstyling and aesthetics in Sudbury, in 2010. She has been with the all about massage team since the winter of 2014. Angelina has also been certified in sugaring (hair removal) and aromatherapy. She enjoys spending time with her clients in a relaxing atmosphere, helping them to feel their best whether it is with their foot care, a variety of facial treatments or her personal favourite, the essential touch. This service uses a variety of specially chosen essential oils to help restore balance and boost the immune system. Angelina also performs full body exfoliations, as well as manicures, threading and waxing. Angelina enjoys spending time with young daughter as well as her new passion, sewing! 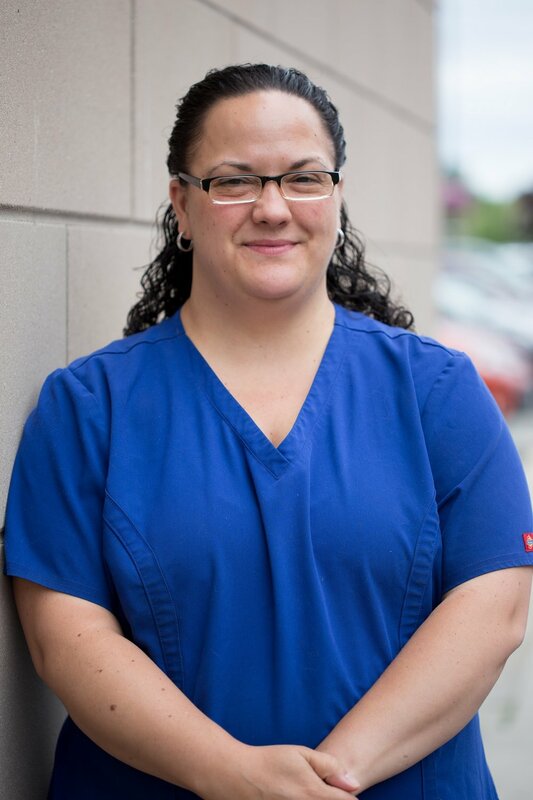 Ashley porringer is a registered massage therapist, who graduated from Algonquin college in Ottawa with an advanced diploma in massage therapy. She has been a registered member with the college of massage therapists of Ontario since July 2007. Ashley's main focus is to de-stress, relax and rejuvenate her clients by using a variety of massage practices. She specializes in trigger point therapy, myofascial release, deep tissue, prenatal and hot stone therapy. When not working, you will find Ashley spending time with her husband and 2 daughters. She and her family enjoy the outdoors and playing a variety of sports from softball and soccer in the summer to downhill skiing in the winter. The reason Ashley choose the massage therapy profession is because of her love and desire to want to help people. She firmly believes that the power of massage can help to alleviate so many ailments and create a more positive outlook on life. Chrissy Paradis attended the Sault College of Applied Arts and Sciences and received her registration in February of 2005. Her pursuit of massage therapy was a natural fit as she had always been complimented on her “healing hands”. Her areas of practice include Swedish massage, hot stone, paraffin and mobility taping. She witnesses the stress put on our bodies from work as well as daily activities and that this can build up and present itself in many ways. With the advancement of technology, it means more and more people are suffering the effects of working at computers, one example being her husband in his career. She gets to see the effects first hand with her husband and his career in the computer department. She can help through massage therapy to help alleviate some of this, and guide people to minimize these effects. When not at the spa helping clients, Chrissy loves spending time with her wonderful husband and their four fur babies. Kimberly Barr has been a registered massage therapist for over 16 years (since July 2000). She studied at centennial college in Toronto way back when it was a brand-new program that they had developed.She also has a degree from Lakehead University in outdoor recreation, parks, and tourism, and a second degree in history. She has always had a passion for learning and has been able to feed that passion with continual education and growth in her personal practice, which has made her a very effective therapist. She is able to include in her treatments the use of acupuncture, cupping, and reflexology. As well, she has extensive training in TMJ treatment and exercise prescription. A highlight of her treatment is the possible use of MPS therapy (micro point stimulation device). This is an electrical stimulation device that helps release scar tissue and assist with pain management and circulation issues. It is FDA approved and a very safe choice of therapy for those who are looking for relief. Putting her philosophy into practice, she has massage therapy every 2 weeks as part of her wellness plan. She truly believes that she would not still be practicing today without regular massage as well as yoga. She lives in new Sudbury, where she shares her home with an awesome 11-year-old girl and a very sweet dog named Molly. Sophie Higgins graduated with honours from Mohawk college in 2015. She has always had a passion for helping people. She takes great pride in her career which is focused on assisting in the health, wellness, and rehabilitation of others. Sophie incorporates both therapeutic treatments as well as relaxation treatments all specifically geared toward the individual needs of each client. Her focus is to use her knowledge of human anatomy and physiology to give her clients an overall sense of well-being and improve their overall health and performance. She enjoys staying active and living a healthy lifestyle and understands the importance of massage therapy in her own life. Her passion for this was a key factor in her decision to become a registered massage therapist. Sophie currently uses a wide variety of modalities in her treatments such as Swedish massage, deep tissue therapy, trigger point therapy, myofascial release, TMJ massage, lymphatic drainage and pregnancy massage. She will be taking continuing education courses in craniosacral therapy, myofascial release, and a variety of others to allow her clients to have the most beneficial treatments possible. Sophie has experience treating conditions related to repetitive stress, poor posture, sports injuries, and everyday aches and pains. She has a special interest in treating tension headaches and migraines. Having suffered from them herself she understands how massage therapy can be beneficial for these conditions.